Ugandan and Kenyan traders will be the biggest beneficiaries after their two countries on Wednesday signed a raft of agreements meant to ease trade, cement political ties and improve their social/cultural connections. The colourful signing ceremony, conducted at the Kenyan coastal city of Mombasa, was witnessed by President Yoweri Museveni and his host, Uhuru Kenyatta. President Museveni, who arrived in Mombasa on Wednesday morning straight from Johannesburg, South Africa where he had been attending the Saharawi Solidarity Summit, is in Kenya on a three-day state visit on the invitation of President Kenyatta. The agreements, clustered into three major categories; defence, trade and social affairs, focus on not only easing means of doing business between the two countries but also resolve some of the sticking issues that have hampered trade. For example, the pacts direct Kenya to consider increase of its sugar quota imported from Uganda to 90,000 metric tonnes from the current 36,000 tonnes. Uganda has been tasked to formally lodge a request to this effect that would create market for at least 54,000 metric tonnes of its surplus 90,000 metric tonnes it produces annually. On the other hand, beef exporters in Kenya can expect to tap into the Uganda market after the latter was directed to lift its ban on beef and beef products from Kenya with immediate effect. The poultry industry in Uganda will also have reason to smile after Kenya agreed to lift the ban on poultry products from Uganda within a week, dependent on Ugandan authorities furnishing then with necessary information making a case for the decision. Another sector set to profit are the tile makers after it was agreed that a joint verification of their quality be conducted within two weeks and thereafter they can be exported to Kenya. For dairy producers in Uganda it should be good news after Kenya agreed to do away with a host on non-tariff barriers that were affecting their exports. For example, they will no longer need authority from the Livestock Department of Kenya to export milk to the neighbouring country. Kenya also clarified that it has resumed issuance of importation permits of dairy products from Uganda, which had stopped on February 1st this year. However, it is not rosy news for those packaging alcohol in plastic sachets after both countries directed Uganda to ban this packaging by May 30th. The two countries will also develop modalities on fighting alcohol use and drug trafficking. The other decisions arrived at focus on bettering the trade environment, including directives that Kenya reduces its numerous roadblocks that affect cargo destined for Uganda, it deploys more staff in Kampala to facilitate trade and allows more Ugandan clearing agents to access their systems. Both countries’ revenue authorities have also been directed to work jointly in enforcing land and lake patrols, continue improving the single customs system at borders, and closer cooperation of revenue officers at the coastal city of Mombasa. On this front, both countries among others agreed to ease the process of getting work permits for their nationals, harmonize methods of verifying temporary travel documents and formally communicate cases of repatriation. Kenya was directed to originate a draft document in one month’s time that makes clear a case for extradition and repatriation between the two countries. With the biting vehicle thefts in Uganda, with most cars reportedly smuggled to Kenya, the countries have agreed to strengthen their border patrols to intercept stolen vehicles. The pacts list some of the notorious porous border points in Busia like Marachi, Sofia and Alupe that must be watched religiously. The countries have also agreed to develop formal guidelines within three months to help check human trafficking, with a call to arrest perpetrators. Uganda will initiate this document in the next three months. On the social and cultural front, the key highlight was a request that Kenya ensures a harmonization of fees charged on Ugandan students at its public universities. The agreements were a result discussions between officials of both countries under the Kenya-Uganda Joint Ministerial Commission that began on March 21st in Kenya. Foreign Affairs Minister, Sam Kutesa, led the Uganda team while his Kenyan counterpart, Monica Juma, headed her country’s team. Uganda’s delegation also included Presidency Minister Esther Mbayo, Deputy Attorney General Mwesigwa Rukutana, Internal Affairs State Minister Obiga Kania and Housing State Minister Chris Baryomunsi. Speaking during the bilateral discussions at Mombasa State House, shortly before the agreements were signed, President Museveni said his trip to Kenya was important because it was solving people’s real problems. He commended the Kenyan government for its infrastructural undertakings that are supporting Uganda’s economy too. “The Standard Gauge Railway will be soon get to Naivasha. The Kenyan government has allowed us to build a dry port there. They have also built a petroleum port in Kisumu, with a pipeline for general petroleum products and they are now working on one for aviation fuel. Lake Victoria, which was dormant will now come to life and we transport these fuels across the waters to Uganda,” said President Museveni. He noted that developing the rail system and water transport will save the road networks from wear and tear, while reducing other hazards like accidents. “What we have been doing is get a tarmac road, pack it with cargo, destroy it then waste time fixing it. This will stop,” he said. The President also encouraged the government technocrats to create more border points so that border populations do not have to travel long distances to find services, adding that whereas the agreements had agreed on some products to be sold across borders, the list could be expanded to include more items like blankets, shoes that are manufactured in Uganda. 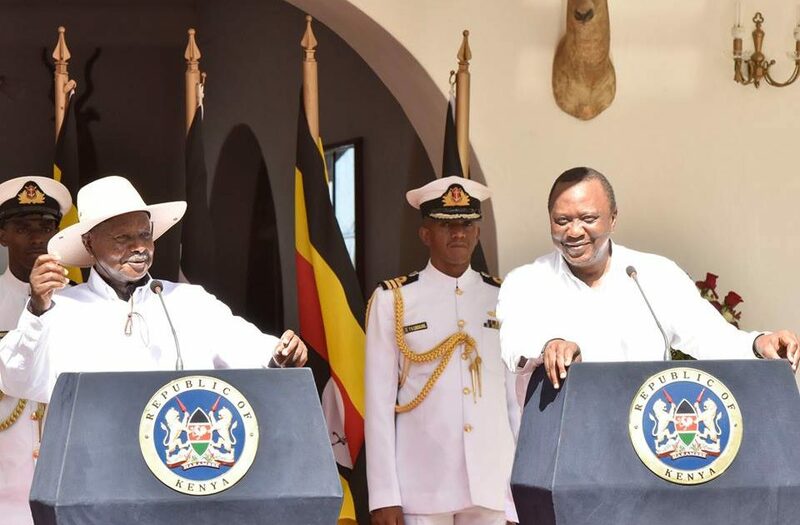 Addressing a press briefing later, President Museveni commended President Uhuru for his Pan-African stand, especially facilitating trade between Uganda and Kenya. “President Uhuru has been very supportive. When he came into office, he straight away handled our perennial problems of delays at Mombasa Port. Previously, some of the people at the port thought they were doing Uganda a favour by clearing our goods. They did not know they were sabotaging both Uganda and Kenya’s economies,” said Mr Museveni. “Efficient handling of cargo is good for all our countries. The more business we do, the better for all of us. Maybe it is because of his business background but President Uhuru has made doing business between our countries much easier,” he added. On his part, President Kenyatta thanked his guest for honouring his invite, noting that its significance lay in the fact that President Museveni was the first visiting head of state to be treated to a state visit at the coastal city. The importance was not lost to the residents, who lined up the streets of Mombasa, to catch sight of President Museveni, while cheering him on. From the airport to suburbs of Changamwe, Makande, Makupa, Saba Saba, Buxton, Kisimani, Bombolulu and the leafy area of Nyali, hundreds lined the streets despite the sweltering heat, to welcome their guest. President Kenyatta said his government would do even more to ensure smooth trade between Uganda and Kenya, but urged technocrats from both countries to ensure that what had been agreed on is implemented in the given time frames. He also indicated that President Museveni would be the first visiting head of state to use the Makadara Express train from Mombasa to Nairobi, when he boards the facility on Thursday afternoon. His guest quipped, “It is an experience I am looking forward to”.